Meet Amanda Flower/Isabella Alan this Fall! Fall means two things to me: Pumpkin Spice Lattes and Book Fair Season. 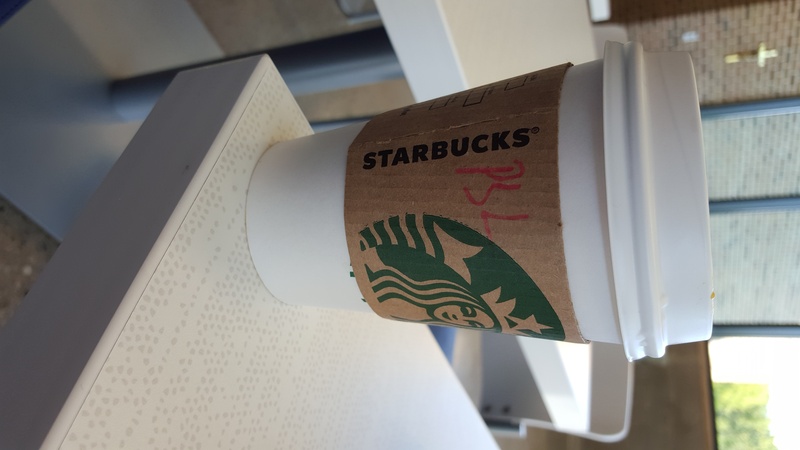 Yes, I am one of the hordes who goes absolutely gaga over Starbucks’ PSL. When September strikes, I begin asking my local barista if the PSL has arrived. It officially launched on September 8th, but I got one a few days earlier at my local Starbucks. Nothing can compare to the Starbucks version of the pumpkin spice latte. I tried one by an unnamed competitor over the weekend and it wasn’t even close. So with my PSL in hand, I face the fall and book fair season. In Ohio and in neighboring states many book fairs are held in the beautiful Midwestern autumn, and I will be appearing at several. I would love to meet you at one of the below events! If you can’t make one of these, check your local paper and see what book events are happening in your own area. Murder, Served Simply by Isabella Alan Pre-Order Giveaway! 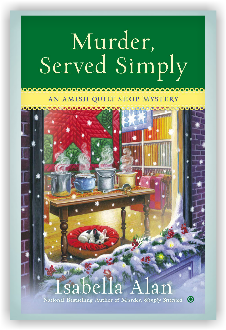 I’m celebrating the upcoming release of the 3rd Amish Quilt Shop Mystery, MURDER, SERVED SIMPLY, on December 2, 2014 by giving away an adorable 2″x3″ magnet of the novel’s cover to everyone who pre-orders the MURDER, SERVED SIMPLY. Amazon | B&N |Books-A-Million | CBD | Anywhere Books are sold! Giveaway is limited to U.S. and Canadian residents. Giveaway ends on December 1, 2014. Magnets will be mailed the first week of December. 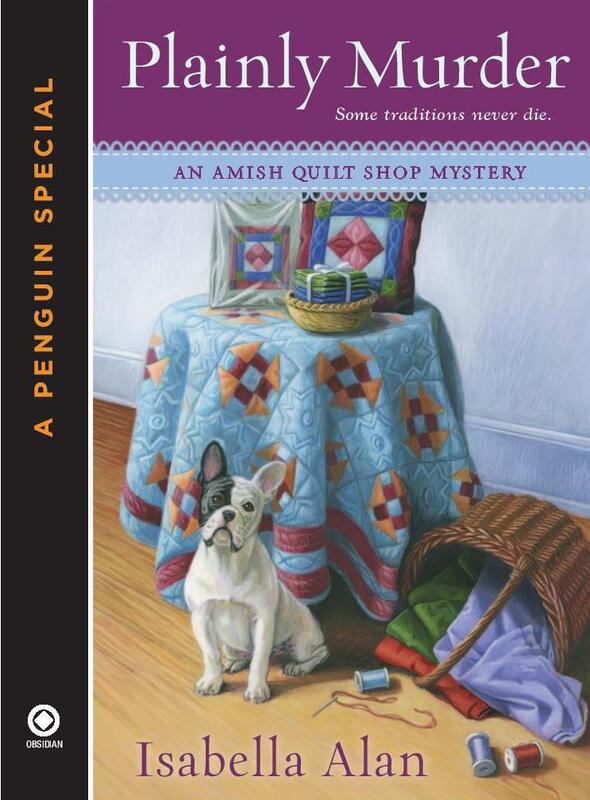 Last week my prequel e-novella to the Amish Quilt Shop Series, which I write as Isabella Alan released! It’s know available on all ebook formats for $2.99! Here’s the first chapter, to introduce you to my Amish town of Rolling Brook. Enjoy! A person might think it’s easy to spot a black and white French bulldog wearing a red and purple striped sweater and matching boots in the snow. That person would be wrong. I brushed my long blond curls out of my face as I peered under an old feed trough on my aunt Eleanor Lapp’s Amish farm. I found pebbles, stray pieces of hay, and an abandoned spider web—at least I told myself it was abandoned. No French bulldog. I dusted snow and dirt off my corduroy-clad knees as I stood. My Frenchie, Oliver, was scared into hiding by my aunt’s chickens. It hadn’t even occurred to me that Aunt Eleanor allowed the chickens to roam the yard. If I had known, I would never have taken Oliver outside for a potty break without first corralling the wayward poultry. Oliver took one look at them and bolted. He suffered from an unexplained phobia of birds. The chickens were the last livestock on the farm. The cows, sheep, and horses my aunt raised during my childhood had been sold to pay her medical bills. “Oliver!” I called as I circumnavigated the outhouse, which was no longer in use since my aunt’s Amish district adopted indoor plumbing, praise be. I shivered at the idea of scurrying to the outhouse in the middle of a frigid February night. He wriggled forward, and the dot of red, his boots, disappeared underneath the tree. Well, that backfired, I thought. And when had he learned English? Suddenly frantic barking peppered with high-pitched tweets disturbed the quiet winter morning. Three blackbirds zoomed from the tree like missiles. I ducked at the last second before they beaned me in the head. Oliver was a breath behind. His eyes were the size of oranges and he ran at me full tilt, catapulting his solid body into the air. “Oomph!” The wind whooshed from my lungs when I caught him. I stumbled back on the slick snow-covered grass but managed to maintain my footing. I rubbed Oliver’s back as if he were a human toddler. “It’s okay. It’s okay. They’re gone.” He burrowed his head into my chest. Maybe my fiancé, Ryan, had been right. Maybe I should have left Oliver in Texas with him. I turned and started to carry him to the small pale yellow ranch house with black shutters that my uncle Jacob had built nearly forty years ago on a corner of his family’s land. He had built the house right after my aunt and uncle married. The couple had been unable to have children, and much of the Lapp acreage had been sold to other Amish farmers. After my uncle died, my aunt kept a tiny corner of the original property for herself along with the little yellow house and a flock of aggressive white chickens. When I drove to Holmes Country from the airport the day before, I was pleased to see that the house appeared just as it had when my parents and I moved to Texas when I was ten. The clip-clop of horses and the rattle of buggies took my attention away from Oliver and the chickens. Two Amish buggies turned from the road onto my aunt’s property. Oliver burrowed his black and white head into my shoulder again when he eyed the large horses pulling the buggies closer to us. “We aren’t in Dallas anymore,” I whispered to the dog. His batlike ears flicked toward my voice. The horses came to a stop side by side. A middle-aged Amish woman sat in the driver’s seat of the first buggy. She set the reins across the buggy’s dashboard and had an economy about her movements as she climbed down from the buggy, pulling a horse blanket out with her. She waved to me before securing the blanket on her horse’s back. I frowned. Oliver was much more than just a dog. The bird trauma forgotten, the Frenchie gave her his best doggie grin and licked her hand. Rachel covered her mouth to hide her smile. “Eleanor is ready for us?” Anna asked. My face fell slightly. “Today is a good day.” My aunt had been battling cancer for the past three years, and recently the disease resurfaced with a vengeance. As soon as I heard the cancer returned, I was on the next plane to Ohio. I wanted to spend as much quality time with my favorite aunt as possible. Not that I thought the worst—she beat it before, she would beat it again. Neither Ryan nor my mother, Aunt Eleanor’s much younger sister, were pleased that I’d left Dallas in the midst of wedding planning. “I almost forgot!” Rachel hurried back to Anna’s buggy. “I brought some treats from the bakery to share.” She set her quilting basket on the floor of the buggy and removed a large flat basket covered with a navy blue linen cloth. Oliver bumped into the back of my calves. Apparently, he didn’t want to be on his own in this strange snowy world. Third child? Rachel looked no more than twenty-five. I was thirty-three and not yet married. In the Amish world, I would be a spinster. Inside the house, I took the ladies’ black cloaks and bonnets and hung them on the pegs by the front door while my aunt welcomed her friends with warm hugs. She wore a black kerchief under her white prayer cap to cover her bald head. I knew that she wore that kerchief more for warmth than from embarrassment. My aunt was a handsome woman, but she had never been the least bit concerned about her appearance. Aunt Eleanor owned Running Stitch, an Amish quilt shop in the downtown area of Rolling Brook—well, as downtown as a tiny Amish town can be. When she became too ill to manage the store, Martha stepped into the role and had been caring for most of the shop’s day-to-day operations for the last two years. Martha sat a little straighter in the rocking chair and beamed under my aunt’s praise. “So they are cast-off pastries,” Martha said with a mischievous glint to her eye. As I helped Oliver out of his boots, I smiled, happy that my aunt felt well enough to joke with her friends. The Frenchie curled up in front of my aunt’s black potbelly stove, still cozy in his striped sweater. Aunt Eleanor grinned and some of the fatigue fell from her face. “I’m sorry, Rachel. We should not worry you so. Danki for the doughnuts and muffins. I know we will all enjoy them with our tea and kaffi.” She sat on a matching rocking chair to Martha’s. I heartily agreed, even though I couldn’t eat one. I was on a strict fifteen hundred calorie diet for the wedding and already spent my day’s allotment, plus half of tomorrow’s, on the breakfast of eggs and pancakes my aunt insisted on feeding me. I winced as I foresaw extra hours in the gym with my sadistic Norwegian trainer, Ludvik, back home. Perhaps he’d even make me do another juice cleanse. Ludvik swore by them. I shuddered. “A bit.” It was easier than explaining the juice cleanse to a room of Amish women. The ladies chatted as they prepared their mugs of tea and coffee to their liking and set their quilting projects out. I removed the appliqué wall quilt I was making on my lap as well. Aunt Eleanor remained in her rocking chair, and I handed her a cup of tea and a doughnut. Rachel eased into a corner of the couch, and Anna perched on an armchair. Bright white winter light reflected off the snow outside and through the sparklingly clean windows. Despite her illness, my aunt kept a spotless home. I winced to think what she would say about the dirty dishes I left in the sink back in Dallas. My aunt reached into a bushel basket sitting beside her chair and pulled out a folded quilt. “I had a special reason for asking you all to come here today.” She smiled at me. “Other than to see my beautiful niece.” She smoothed the quilt in her lap. 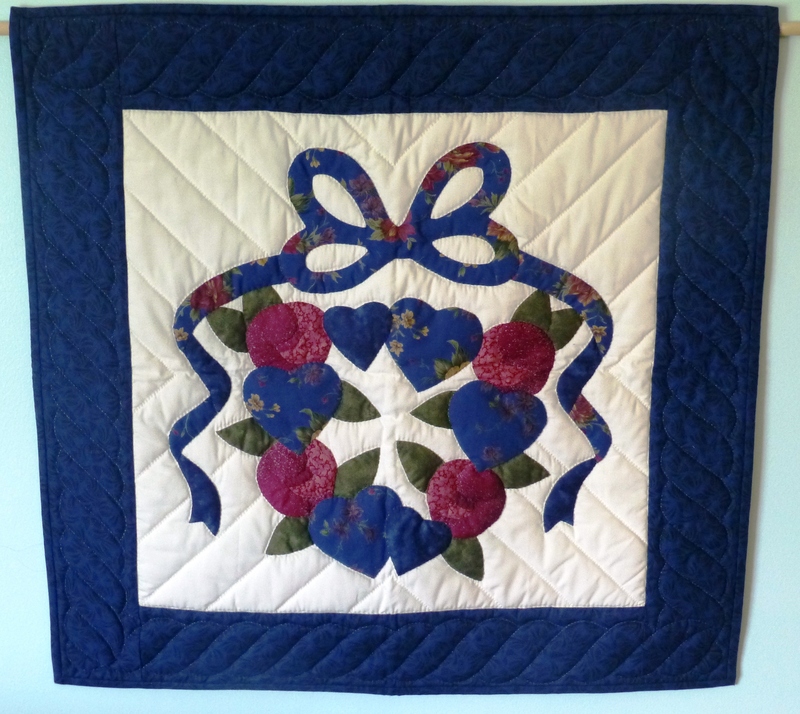 It was a Sunshine and Shadows patterned piece made with hundreds of two-by-two-inch solid-colored squares that rippled outward from one square in the middle of the quilt. The two inch border was in navy, and wave stitching held the cloth and batting together. Even from across the room, I could tell the handiwork was exquisite. “It is,” my aunt replied. “How did you get it?” Rachel asked. “She didn’t give it to me to keep,” my aunt said. New Book Cover & New Author Website! Today, I’m excited to share a little bit about two new series. First is the cover of A Plain Death. This is the first in the Appleseed Creek Mystery Series coming from B&H Publishing in July 2012. Currently, I am working on revision, and the book is on track to have galleys by the end of 2011. In A Plain Death, an unlikely friendship between a high-tech woman and a runaway Amish girl leads to murder. Her first day in Appleseed Creek, Ohio, Chloe Humphrey, befriends Becky, an ex-Amish teenager looking for a new home. While driving Chloe’s car, Becky collides with a buggy, killing an Amish bishop in the process. The case moves from accident to murder when police reveal a cut brake line. Now, Chloe and Becky’s handsome brother, Timothy, must discover who the real intended victim is before the murderer makes a second attempt. The second reveal is the website for my pen name, Isabella Alan. The first book I will be writing under that pen name is Murder, Plain and Simple to be published by NAL in late 2013. Check it out at www.isabellaalan.com. My main website www.amandaflower.com will be getting a brand new look by the end of the year too. Stay tuned.